The family that plays together stays happy together and Pittsburgh has a rich variety of fun options. Here are 10 adventures that will allow your family to both explore the city and keep active outdoors. Each one pairs a cool activity with a stop for a special treat. Kayaking on calm water at North Park Lake. Photo by Mandy Yokim. 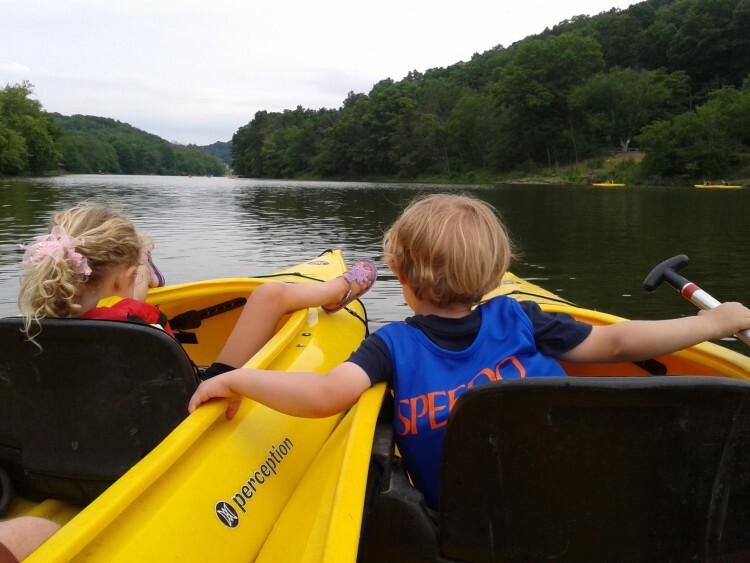 If your family is new to kayaking then head to North Park where the lake is calmer than the Allegheny River. Kayak Pittsburgh welcomes beginners who can easily learn using kayaks that are long and stable like a canoe but generally easier to steer. Highlights include maneuvering around a small island and kayaking through a short tunnel or, as my kids call it, the echo chamber. Fall hours will be Thursday-Sunday during September and weekends only during October. Enjoy lunch afterward at Over the Bar Bicycle Café, right next to the kayak rental. Grab a seat on the patio to enjoy the beautiful view of the lake. Bonus: Kids’ meals are served on a souvenir Frisbee that they can toss around in the park. 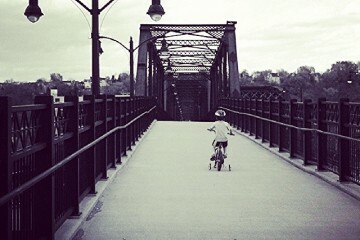 If your family likes to bike together, try the Three Rivers Heritage Trail starting on the North Side near Heinz Field. This easy path meanders past PNC Park along the Allegheny River–with stunning views of the city–through the bucolic setting of Washington’s Landing and into Millvale Riverfront Park. Point out the interpretative signage along the trail that highlights various aspects of Pittsburgh history. Want to know more about biking with your family in Pittsburgh, including where to rent gear? Read this Kidsburgh feature. When you need a break from the trail, park your bikes and stop in at Redfin Blues near the Washington’s Landing Marina. A favorite activity at this waterfront grill is boat-watching from the large deck that overlooks the Allegheny River. You’ll feel like you’re on vacation someplace other than Pittsburgh. 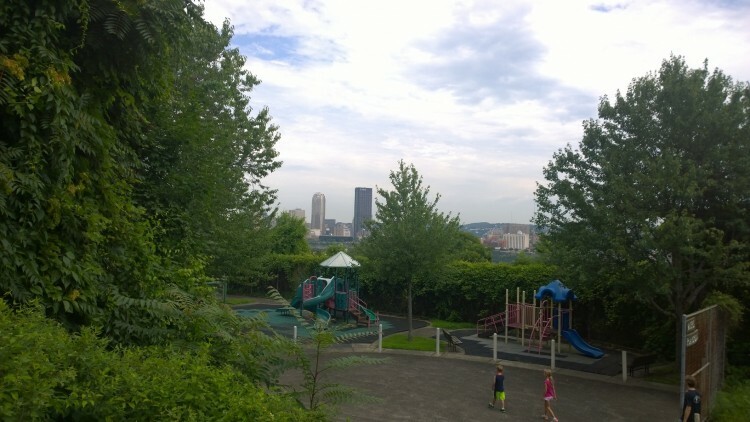 Stunning city views from the steps above Winters Playground on the South Side Slopes. Photo by Mandy Yokim. This October the South Side Slopes Neighborhood Association will host the 15th annual Pittsburgh StepTrek, a self-guided and self-paced tour of some of the 68 sets of public steps in the neighborhood. Start exploring now with the Church Route, which leads you along a series of streets and 820 steps (379 up, 441 down). Highlights include amazing views of the city over the Monongahela River and a hidden playground that makes a perfect stopping point for kids to take a break. After getting your exercise on the steps, head to The Milkshake Factory for a guilt-free treat. With so many flavor choices, every member of your family should be able to find a favorite. Helpful tip: half-price happy hour milkshakes on Wednesdays from 4 to 6 p.m.
Fun stop at Gus and Yia Yia’s Icy Ball stand in Allegheny Commons on the Northside. Photo by Erica Gidley. This transportation adventure is simple, inexpensive fun that’s perfect for even the youngest kids. The journey starts at the Allegheny ‘”T” Station by the Carnegie Science Center on the North Side. As you head to the Station Square stop, kids will enjoy the views of Heinz Field, forging under the Allegheny River and dashing through the city. As you exit and pay, make sure to ask for a free transfer to ride the Mon Incline just a short walk from the station. You’ll have an hour to enjoy the beautiful view from Mt. Washington before the transfer expires. Full fare round-trip cost? Only $5. Kids 5 years and under ride free, kids 6-11 years pay half fare. Note: the Mon Incline will close for construction after Labor Day for about three months. After seeing the iconic view from Mt. 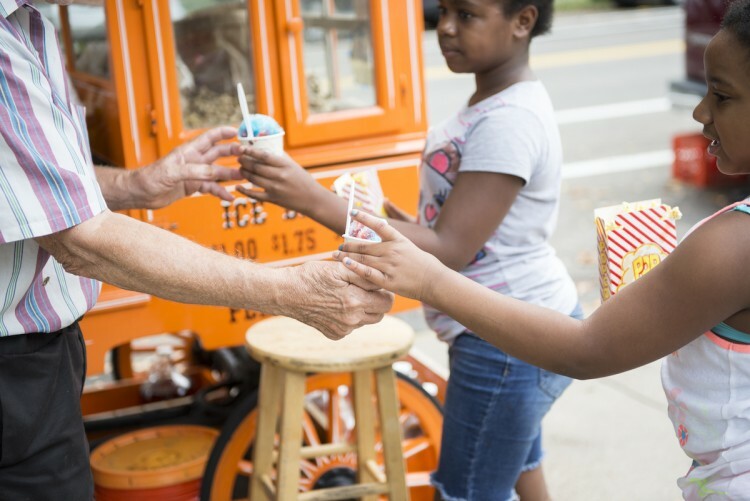 Washington, return to the North Side via the T and make the short drive to visit the iconic Gus and Yia Yia icy ball stand in Allegheny Commons on West Ohio Street. Gus has been hand-shaving ice for these cool treats since 1951. Family fishing at lakes around Pittsburgh. Photo by Miranda Smith. Want to try fishing with your kids? 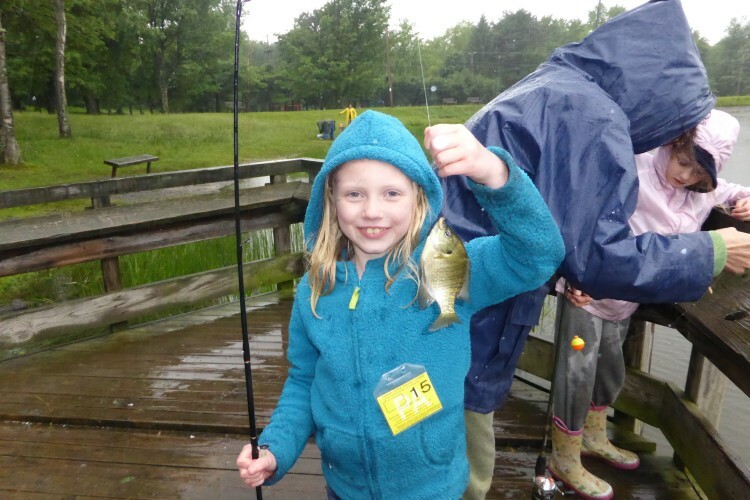 Check out the learn-to-fish opportunities through the PA Fish and Boat Commission. These educational programs are free of charge but registration is required. Your family will learn basic skills like casting, tying knots, baiting and more. No fishing licenses are necessary and all equipment is provided. Upcoming programs take place at Dutch Fork Lake in Washington County on September 13th or at Pine Township Community Center on September 19th. If you know the basics but just need fishing rods or other equipment, you might consider this free opportunity to borrow what you need. Make this adventure a combo: fish with the family at North Park Lake and add a visit to Tomato Pie Café on East Ingomar Road just outside of North Park. Try for a table on the front patio. Tip: It’s cash only. Posing with the sports statues at PNC Park. Photo by Erica Gidley. Attending a game at PNC Park is super fun but even if the Pirates are out of town you can still have a blast posing with the statues, each honoring a legendary Pirates baseball player. Get started at the center field entrance with the Roberto Clemente statue. Head down the sidewalk toward the left field gate and pose with Willie Stargell. Make your way around the park to the home plate main gate where Honus Wagner will greet you. Lastly, near the right field entrance Bill Mazeroski’s statue recreates a scene from his memorable run around the bases after hitting a home run to win the 1960 World Series. After creating your statue scrapbook, head over to the Warhol Café in the Andy Warhol Museum lobby (museum admission not required). And if you still have a few more smiles left for the camera, pose for a souvenir family picture in one of the two photo booths at the museum (one in the lobby and the other on the lower level). How much better does fruit taste when you pluck it right off the tree? Find out at Simmons Farm where you can pick peaches, apples and more from the orchard. Get a container at the market before picking but make sure to call ahead to check availability. You can also cut flowers for a beautiful bouquet straight from the farm’s flower fields. Scissors and buckets provided. Go on Wednesday and you can head to the Peters Township Farmers Market afterward for dinner. A wide variety of vendors ensures plenty of fresh food choices. Creek hiking at Walker Park near Sewickley. Photo by Kim Harbaugh. 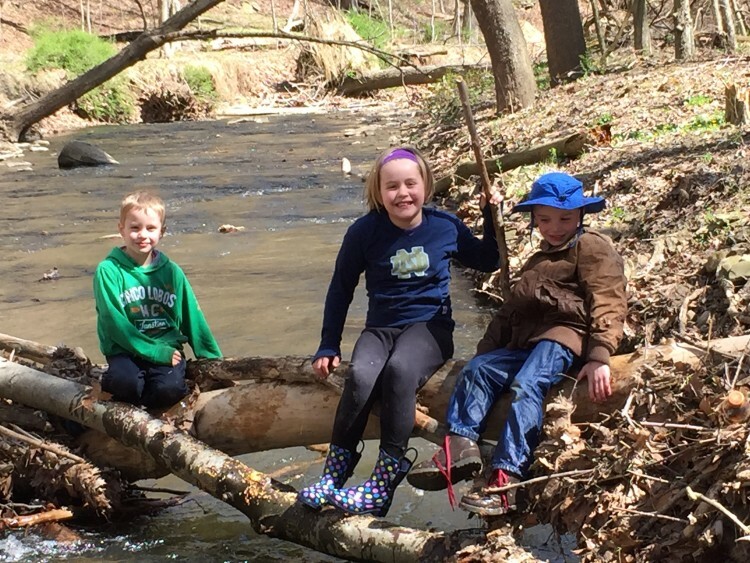 It’s fun to combine hiking with water play and your family can do just that at Walker Park along Little Sewickley Creek Road in Leet Township. The creek is shallow enough to walk through and most of the area is shaded. Have fun balancing on fallen trees and looking for salamanders. Make sure to bring water shoes or old sneakers along with a change of clothes and a towel: you will get wet. And messy. After your creek hike head to The Ultimate Pastry Shop, a quaint bakery in Sewickley. Choose from cute cookie designs, colorful gourmet cupcakes, luscious cakes and other desserts. Hartwood Acres is a great place to be during one of the many festivals and free concerts on the lawn. But with 629 acres of green space and wooded trails, it’s worth a visit anytime. Take the trails to the Hartwood Mansion, a circa-1929 Tudor home that offers tours but is an adventure just to walk around and explore. Highlights include the beautiful flower garden (with butterflies everywhere), fascinating architecture, a dog cemetery and horse stables. Check out the Hartwood Restaurant for lunch after you leave the park. The food is fresh and the patio seating is beautiful on a late summer afternoon. Ask to view the Whispers window, crafted in the late 19th century of stained and painted glass. Nature hiking is fun at Pittsburgh Botanic Gardens. Photo by Erica Gidley. 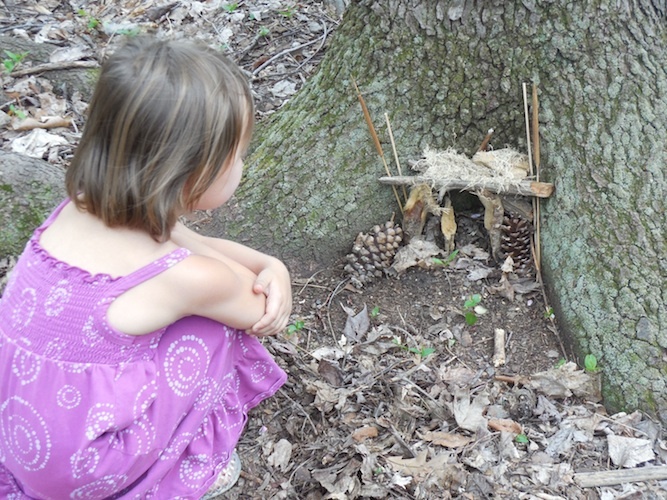 The Pittsburgh Botanic Garden is a magical place to take your family for a nature hike. Get started on the Arboretum Trail and Lotus Pond Trail, two paths that cover less than a mile when walked together making them appropriate for even the youngest hikers. Look out for the stepping stones across the pond, bird feeders and loud bull frogs among the lilies and irises. You might even see a blue heron fly in for a fish. 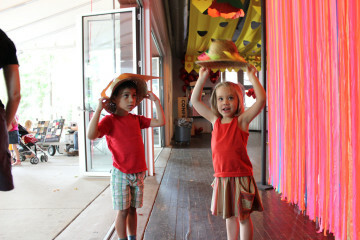 Discounted admission is available for Allegheny County residents and military. Check out all the trails available on this map. Grab a delicious lunch at Café Chocolade and try to get seating outside on the garden terrace. Save room for one of the European pastries, many of which are gluten-free. Got some ideas that your family loves? We welcome comments below!